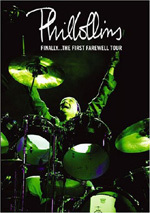 This Video Show DVD traces the band's history during the height of their popularity with Phil Collins, Mike Rutherford, and Tony Banks as the main force behind their success. Peter Gabriel appears in a 1999 version of "The Carpet Crawlers." The DVD features classic MTV staples like "Land of Confusion," "Invisible Touch," and "I Can't Dance." 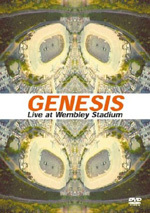 Now visually digitally remastered, this is the first time all of the Genesis promotional videos have become available on DVD. In addition, rare BBC footage of "Paperlate" is included. Every year when the Rock ‘n’ Roll Hall of Fame announces its inductees, complaints arise. Sometimes folks gripe about the acts who made it into the Hall, but usually fans moan because the Hall ignored their favorite. Many of the acts cited will not and should not make it in, but some of the criticisms are legitimate. For instance, it remains absurd that Black Sabbath aren’t in the Hall. I don’t like the band, but their impact on rock is far too substantial for their omission. At least they’ve been nominated. More bizarre is the fact that the Hall consistently ignores Genesis. A very long-lasting and successful band in their own right, two members – Peter Gabriel and Phil Collins – went onto solo careers that are Hall-worthy in their own right. Heck, even guitarist Mike Rutherford churned out a few hits with Mike and the Mechanics! It seems to me that Genesis did more than enough over their decades together to warrant induction. I’m no fan of progressive rock, but Genesis grew out of that genre and definitely are among rock’s all-time elite. Maybe the voters at the Hall will give this new DVD a look and reconsider. Called The Video Show, this package collects 32 music videos that span a period of 23 years. These mostly appear in reverse chronological order. We start with tracks from 1991’s We Can’t Dance album and then go backwards to 1976’s A Trick of the Tail. 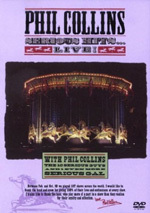 However, the DVD then leaps to 1997 for three songs from that year’s Calling All Stations. Why the change? Because the 1997 Genesis featured Ray Wilson on vocals and doesn’t seem to be considered “real” Genesis; these videos feel almost like footnotes. The package then ends with the 1999 version of “The Carpet Crawlers”. That tune originally appeared on 1974’s The Lamb Lies Down On Broadway, but this track updated it for 1999 and features both Gabriel and Collins on vocals. Enough background – let’s dig into the videos. I’ll look at each one individually and offer a few comments along with a rating on the 1-10 scale. I’ll also provide album credits. Invisible Touch (Invisible Touch, 1986): Riding on the heels of Collins’ massively successful 1985 solo album No Jacket Required, I believe Touch was the biggest selling Genesis album, and it introduced them to an era in which they played stadiums. Whether this was good is a subject open to debate. “Touch” the tune doesn’t stand among the best work done by the band or Collins solo. Its synth-based sound hasn’t aged well, though I thought it was a silly tune 19 years ago. The video offers little more than a goofy take on the usual lip-synch performance genre. Collins clowns around on the set and that’s about it. 4/10. Paperlate (3X3 EP, 1982): Another pop Genesis tune, this one stands as a terrific number. When I stated that I prefer pop Genesis to prog Genesis, I probably should have been more specific. I don’t think a lot of Genesis from 1986 on, and I don’t much like their work prior to 1978. That leaves a small window of material I enjoy, and “Paperlate” represents that element at its best. I like pop Genesis that doesn’t necessarily sound like Collins’ solo work. I don’t know if this makes sense, but there it is! The “Paperlate” video actually comes from a May 27, 1982 appearance on Top of the Pops. That places it firmly in the category of lip-synch, and restricted lip-synch at that, since the band is stuck on a small stage. At least it has some historical value. 4/10. Abacab (Abacab, 1981): The farther back we go, the more unfair it probably becomes for me to criticize lip-synch clips. After all, more dramatic or involving videos didn’t really start to emerge until 1982 or 1983, so it’s not right to expect anything like that from earlier days. A Trick of the Tail (A Trick of the Tail, 1976): The DVD’s oldest performances come from the band’s first post-Gabriel album. This one sticks with performance, but it maintains a goofy charm as all four members – Steve Hackett was still with them back then – gather around Banks’ piano. We also get the odd site of a miniature Collins as he sings on top of the piano keys and elsewhere! We also get an odd image of Hackett with a monster’s claw. All that’s good enough to make this one above average. 7/10. Not About Us (Calling All Stations): Wilson-era Genesis ends with this track. Thank God! This one offers more nonsense with ordinary people and fails to become anything interesting. The bland ballad makes me long for Collins’ syrupy tendencies. 4/10. The Carpet Crawlers (Turn It On Again: The Hits, 1999): Although this video features vocals from both Collins and Gabriel – quite a cool coup – unfortunately we don’t see either in this video. It looks like something we’d expect from Gabriel’s solo tracks, as it features a mix of surreal elements and an occasional glimpse of classic Genesis. Actually, the tune sounds like modern Gabriel. I don’t know the original version, but this one would fit in well on a Pete solo album. Collins does vocals, but only in the background; he doesn’t take a lead. This is odd since Collins had a more prominent singing role in the album version. That one lasts five minutes, 39 seconds, while this edit only goes for four minutes, nine seconds and turns Collins into a footnote. That eliminates the remake’s main appeal: dual leads from Pete and Phil. The arty video can’t overcome that drawback. 4/10. Genesis: The Video Show appears in an aspect ratio of 1.33:1 on this single-sided, double-layered DVD; due to those dimensions, the image has not been enhanced for 16X9 televisions. Actually, “Tell Me Why”, “Carpet Crawlers” and the three Calling All Stations videos went with a 1.66:1 ratio. Everything else was fullscreen. The quality of the clips also varied, but unfortunately, they usually presented fairly unattractive visuals. While they generally seemed typical for their eras, the videos nonetheless displayed more concerns than I expected. Unsurprisingly, the earliest numbers looked the ugliest. Mostly shot on film, the clips from the start of the Eighties and Seventies presented rather unattractive visuals. They suffered from flat and listless colors as well as imprecise focus, grain and other print flaws. Once we got past those proto-videos, the rest… generally remained pretty drab. Sharpness appeared moderately weak. Many of the clips looked fairly soft and indistinct. Focus didn’t come across as atrocious, but the clips usually displayed some gauzy and hazy images. Jagged edges and moiré effects remained minor, but haloes noticeably marred many of the videos. Did Video Show look worse than I expected? Not really. I’ve seen lots of music video collections that span this set’s eras, and most of them look about the same. Occasionally one surpasses the others, but the majority of them demonstrate similarly murky and muddy visuals. That’s just an artifact of the materials used in the various periods. I still didn’t feel Show deserved a grade above a “C-“, but it remained consistent with what I anticipated. Happily, no such concerns affected the excellent audio of The Video Show. The DVD offered both Dolby Digital 5.1 and DTS 5.1 soundtracks. I found the pair to sound identical, as I discerned no substantial differences between the two. For all the tracks, audio quality seemed excellent. The music presented clean and clear highs, and vocals always sounded natural and distinct. Drums popped as they should, and guitar fills rang appropriately. Bass response appeared tight and deep, and low-end never become loose or rough. A few tracks were less impressive than others, but that related to the original production; for example, Invisible Touch always was a little on the thin side. Overall, I really liked the audio of Video Show. Don’t expect many extras here. For each video, if you hit “enter” during its title screen, you can check out information about it. We learn who wrote, performed and produced the track as well as who directed the video and from what album it comes. We also see the single’s sleeve when available as well as some photos from the appropriate area. These screens repeat notes already found in the DVD’s package, but it’s a decent way to augment things. Besides, given the fact we already get 32 music videos as the main package, I won’t complain too much about an absence of other supplements. 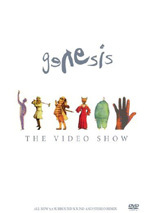 Genesis: The Video Show acts as an excellent greatest hits compilation. Will you find a surfeit of terrific music videos here? No, as most of them are fairly ordinary. As for the presentation of the material, the videos look bad, but that’s mostly due to the source material. The remixed audio sounds absolutely terrific. You won’t find substantial extras, but with 32 videos, I don’t mind. This is a good little collection.